If you're a Tumblr user, please visit us at Diru dailyeah! Vocalist Kyo’s identity is something that has received high appreciation not only in Japan, but the world over. But, according to the man himself, just to what esteem does he hold himself? Regardless, to solely believe in oneself self alone is the peek of self confidence. But to the Kyo san who continues throwing his voice out into the world through DIR EN GREY and sukekiyo, just what is his reason to continue? 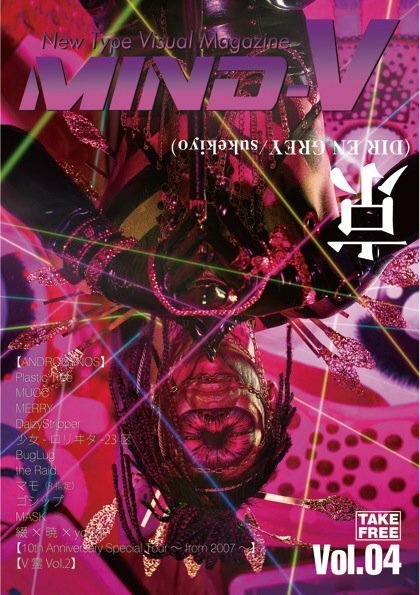 His visually shocking front page spread together with his thoughts and imagination, Kyo san shares all. We’re taking orders for Die’s collaboration tights until the 16th this month. Everyone who orders withing this period will receive an original postcard with Die. People who still haven’t ordered them better hurry! My memory is that it’s No.1 concert on DIR EN GREY’s Black History list, I can only see it as the most painful one. Of course we released some footage as an indies band. And usually when some artist plays in Budokan they will surely release a footage from that, right? It’s natural. But all members decided it’s too much and we didn’t release [anything from that performance]. I had a meal with Kaoru from DIR EN GREY yesterday. It was a dreamlike evening where I could talk with him about many important and fun things. BEST ALBUM『VESTIGE OF SCRATCHES』 and LIVE Blu-ray『ANDROGYNOS』are so amazing!